Junior Claire Davidson and senior Alan Litman wrapped up Tufts’ 2018–2019 women’s and men’s squash seasons by representing the Jumbos at the College Squash Association (CSA) individual championships at Brown University in Providence, R.I. this weekend. Litman competed in the Molloy Cup South Division, while Davidson squared off against opponents in the Holleran East Cup. Both players were top players on their respective teams this season; Davidson led the women’s side at the No. 1 position, while Litman occupied either the No. 3 or No. 4 position. Davidson, a Rhode Island native, found little home-court advantage in her opening round match, considering her opponent was sophomore Alexa Jacobs of Brown. Jacobs, who plays No. 1 for the Bears, has more than just her lineup position in common with Davidson, who earned her second straight appearance at the individual championships. The two squared off in Rhode Island for high school squash and have also spent the summers training together. Davidson didn’t feel fazed by her familiar foe. “Lots of her team were there, but she’s a girl I know really, really well,” Davidson said. In a sport where ranking can usually tell the story, Jacobs held the early edge with a 4.7 to Davidson’s 4.2. Jacobs triumphed over her rival, knocking off Davidson in a 11–4, 11–3, 11–4 sweep. With a win over her training partner and longtime friend, Jacobs advanced to the quarterfinals where she was defeated in three games by first-year Elle Ruggiero of Princeton. Davidson was knocked down to the consolation bracket to face Mount Holyoke senior Nadindhi Udangawa. The match was much tighter than Davidson’s round of 16 contest, but she eventually lost by a score of 11–5, 11–4, 12–10. 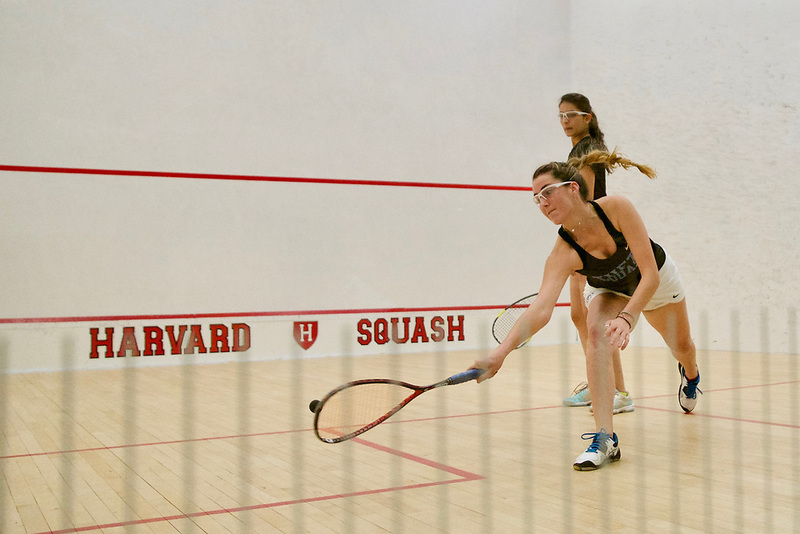 Going into the match, Davidson knew it may well be the final time she steps onto the collegiate squash court until her senior season at Tufts. Davidson left this match with a reaction similar to the one that her team had following last weekend’s CSA team championships, where the Jumbo’s lost in the final to Bates. It was an extremely tight match in a sport that sometimes casts predictive ranking and seeding to the wind. In such an individually minded game, however, Davidson says she relishes the team element. With such a promising team, it’s no wonder Davidson feels compelled by the team side of the game. “Keeping a regular fitness and practice schedule in the off-season is going to be super important in pushing us over to the B Division,” Davidson said. Apart from her short individual play, reaching the B Division with her team is Davidson and her team’s number one goal next year. For Litman, this year’s individuals were a bittersweet end to his four year career. The Jumbos’ number one player had a concussion, and the number two and three players opted not to participate, so Litman happily seized the opportunity. Opening play against senior Ricardo Lopez of the University of Rochester, Litman fell in three games by a score of 11–2, 11–5, 11–7. “He’s definitely one of those guys who’s a top 16, top 20 player in the country, so it was a really tough match,” Litman said. Lopez played in the second position for the 14–4 Yellowjackets, who fell to Trinity Bantams in the A Division semifinals in the previous weekend at team nationals. After beating Litman, Lopez advanced to the semifinals of the South Division, losing to eventual champion Enzo Corigliano of St. Lawrence University. In his consolation round match, Litman proved to be a much tougher opponent, though he still lost to Navy senior Senen Urbina (11–6, 7–11, 11–4, 11–5). “This was the highest level of squash I’d ever seen at a tournament I played in, for sure,” Litman said. Despite a tough postseason as a team, Litman continually put out competitive four and five game showings in the NESCACs and the CSAs. The environment in his draw, however, felt more relaxed than the regular season. All of these players were coming off grueling regular seasons, but Litman found it hard to take his foot off the gas in his final showing as a Jumbo. A graduate of Lower Merion High School in Pennsylvania — the same high school that Kobe Bryant attended – the senior tried to embody Bryant’s competitive attitude in his final collegiate squash event. Despite putting on the Tufts uniform for the final time this weekend, Litman can’t help but feel excited for next year’s up-and-coming squad. “With new facilities and a new head coach who’s doing a great job, I think we’re going to recruit some excellent players and keep moving up the rankings in the years to come,” Litman said.